If there’s one thing that no one will be accusing M. Night Shyamalan’s upcoming Glass of being, it’s boring. If the newly released second trailer is any indication, this follow-up to both Split and Unbreakable is going to be one of 2019’s craziest, most colorfully outlandish films. As we saw in the film’s first trailer, the three primary pieces—David Dunn (Bruce Willis), Elijah Price (Samuel L. Jackson) and Kevin Crumb (James McAvoy)—have all been brought together in the same hospital, being treated by a psychiatrist played by Sarah Paulson. Her character doesn’t believe that any of them manifest what might be referred to as overt “superpowers,” something she’s no doubt going to have to be corrected on in ways that are exceedingly painful. Because it’s clear that once these trio break out, all hell is going to break loose. The trailer is absolutely packed with pulpy goodness, but be warned—if you’re wary of spoilers in terms of story structure, this second trailer gives away quite a bit. 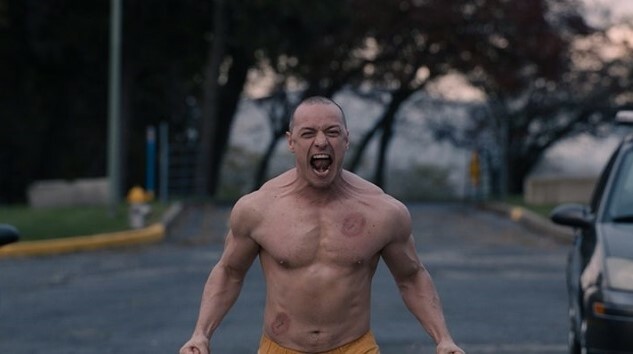 You’ve got James McAvoy throwing people around the room like they’re ragdolls, James McAvoy running on all fours via goofy CGI, James McAvoy bending bars with his bare hands, and generally James McAvoy going all-out Beast. And oh yeah, Bruce Willis is there too, but this is mostly the McAvoy and Jackson show. Curiously absent, by the way, is Anya Taylor-Joy’s Casey Cooke, the young girl who was central to Split. She only appears in the trailer for a moment and has no lines as far as we can tell. Has her role in this story been completely diminished for the sake of putting together an Avengers-style superhero showdown? It’s hard to say, but the tone of the trailer is definitely much more “out there” than either Split or especially the brooding and atmospheric Unbreakable. Glass looks more like M. Night is making some kind of action spectacular, which is … actually a little concerning. Here’s hoping that his attention doesn’t stray too far from the mental workings of the characters, which is what made Unbreakable and Split interesting in the first place. Glass isn’t too far away, being scheduled for a Jan. 18, 2019 release. Check out the full trailer below.